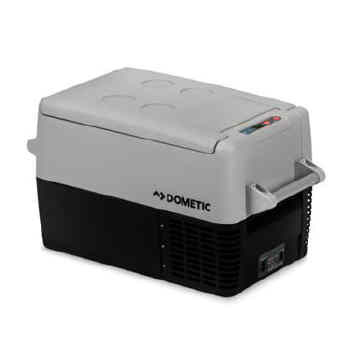 Composed of a high impact polypropylene cabinet, the CF 035 can refrigerate or freeze to 0 degrees F (-17 degrees C). Enhanced by a quick chill / turbo function that runs the compressor at maximum performance until the desired temperature has been reached. Memory feature will maintain preset settings if the system is turned off. And the three stage battery monitor has a low voltage shut-off to protect against a dead battery. Includes a coated wire grid divider to keep foods from adhering to the interior walls. Convenient carrying handles aid in transport and can be easily removed. Interior light helps quickly find contents in the dark. Features include quick chill / turbo function, memory and dead battery protector.